The National Association for Music Education (NAfME) has designated March as Music in Our Schools Month. To celebrate, the jsquared music performance center will be sharing the stories of people who played instruments in grade school and the impact it made on their lives. Today, we feature the production team, Startin5 (Jared Brown, Sterling White) and saxophonist, Laj. At what age did you begin to play your first instrument? Peer Pressure! In middle school, unlike how they do it now by paper schedules, we had the chance to choose electives by going to the class and learning more and asking questions. A few of my friends talked me into going with them to the band elective, I really didn't know what I wanted to do, so I was easily influenced. When I got home that afternoon, I told my mom I wanted to play saxophone. Like any great mom she made the sacrifice to rent a saxophone from Music & Arts. It came with a disclaimer, "You are going to play this saxophone, through middle school, high school, college, church, solos etc!". What was your experience with music during your elementary, middle and high school years? I always loved music class, piano (not the best at that), singing, listening anything related. Just helped to pass time, clear my head and release stress. In elementary school, we had music class and it wasn't until middle school that I really fell more in love with all aspects of music, the love grew deeper throughout the middle school years into my high school years. Who was your favorite music teacher? What made them your favorite? My high school band director, John Jenkins, definitely motivated me and encouraged me to be and do better. It was in high school where my leadership ability starting to grow more and more and I know it was because of his influence. Moving into college the NSU Band Staff (The Dream Team) continued to shape me into a musician and leader and I really don't know who I would be without the push they gave me. What is your favorite band memory from grade school? I can't choose just one memory! I enjoyed marching band - games, competitions. I also enjoyed the symphonic band & orchestra, performing for crowds. However, I did enjoy our New York trip in high school to perform in memorial of 9/11. Did you play an instrument in college? Did music impact your college choice? I continued to play Saxophone in college. Music definitely impacted my college choice. I attended Norfolk State University - came from a family of Spartans (BEHOLD)!!! The first time I remember seeing the marching band, the Spartan "Legion", I was impressed, attended a spring band camp and fell deeper in love with the program. I was not a music major but participated in concert band, symphonic band, Saxophone Choir, Saxophone Quartet, & flute choir. I am an elementary school counselor in Chesapeake, VA.
How has music helped you in your current occupation? My love for music helps me relate to my students who also have a love for music, whether playing instruments, singing in the choir or just because they love whats on the radio -- I can relate! Sometimes when I have a student who is upset I play music and that opens their ears which tends to have the ask questions which calms them down then I can assist them in turning a bad moment of their day into a good one. How has music played a part in your adult life? As an adult, I volunteer with the Booker T. Washington High School (Norfolk, VA) Marching Bookers on the band staff as woodwind coordinator. I also serve as an assistant band staff member for the NSU Spartan "Legion" working with the woodwinds and recruitment team. I have made lifelong friends because of the experiences I have had with music and being part of musical ensembles. WORK HARD, PLAY HARD! Learn all you can while you are young, pick up multiple instruments, study them and grow. Music is more than an elective/activity in school. It truly is an art form that can lead you places you would never imagine. Love and enjoy every musical opportunity experience you have in life! Continue to support Music & Arts in the schools. It is important and vital to the development of students. Student need an array of avenues to express themselves! Just like academics and athletics, Music & Arts is a way for them to do just that! Today, we feature Jasmine Mitchell. Jasmine works in the health care field doing administrative work for an urgent care facility. I started playing because my older brother was in the band starting in middle school and he really enjoyed and I thought it was something I would definitely like to do. Elementary school was very minimal. We played recorders and switched percussion type instruments each week. Middle school is where I actually learned to play the trumpet and was in concert band for one year. However, middle school only lasted two years because of a city switch over from junior high to middle school. Then when I got to high school I no longer played an instrument but became a flag girl and continued through college. While I did not take band as a class in high school, Ronald Collins Sr. was one of the best teachers of music I know. I watched him with the students during band practice and he wasn't always the most patient but was definitely helpful and made sure you knew what you were doing. However it was Mr. Collins who saw the potential in me to be a section leader which earned me bandsmen of the year my senior year. Well grade school was so long ago... however, my music teacher in grade school was the best. I only had him in the 6th grade. Mr Wolf was his name. He was a very free spirit and wanted to make sure that whatever instrument you had for the week it was the one you wanted and felt comfortable with. He was open to trading instruments so that all the children in the class were happy learning. In college I took private lessons on the trumpet again, but, I never played outside of them. I was always interested in playing again but I never had the chance and being in color guard was so much more fun I didn't want to leave the section. I went to Norfolk State because I had to stay in the area to go to school. I honestly did not know anything about show style band as I went to a corp style high school. However, I knew I wanted to continue marching and was very pleased with the decision I made to join the Spartan Legion at NSU. I am currently working in the health care field doing administrative work for a local urgent care facility. Music has always been a large part of life but being in the band is what really impacted me. I learned one of the greatest lessons that any adult can have which is time management. I was the flag coordinator at Phoebus High School and the Assistant Band Director/Flag Coordinator at Surry Co. High School for one year each. Those experiences have been a great part of my life as an adult. While it was not my major in school, it was something that I still wanted to do. I was grateful for the opportunity to help out my friends and still be a part of marching band which is something I hold very dear to my heart. Keep playing. Never ever stop playing. Master your craft. The love of music can take you so far and teach you so many different life skills, all of which you will need to make it in life. The art of music is so under appreciated and the talent of young musicians can bring back to life the art form that is being slowly diminished in our schools. So grab a friend and bring them into in the bond that is the love of music and go far together. Music in Our Schools Month Profile: Juan B. Lascano, Jr.
Today, we feature Juan B. Lascano, Jr. Juan is a teacher at Charlotte Learning Academy in Charlotte, NC and a graduate student at The Johns Hopkins University School of Education. I was always interested in the music that my mother and father would play around the house, but I started playing the recorder in elementary school, which started my interest in music. That following year, my aunt persuaded my parents to place me into a music program in middle school. It was then that I acquired a passion for music and the sound of brass instruments. My initial involvement with music started in middle school with the jazz band. I remember when we played a song by Norah Jones that was being played on the radio. It felt cool to play music that was playing on the radio. When I joined the high school marching band we started playing popular radio songs more often, and that was a great experience for me. I was excited to see the crowd respond to our songs, dances, and formations on the field. Peers would tell us about how much they enjoyed our halftime shows and would express interest in joining the band because we were a family. I wouldn't trade my high school band experience for the world, for many of the friends I met at my high school are my lifelong friends today. Without the bonding nature of music, I wouldn't have met the brothers that I call my friends today. Edward Woodis was my favorite music teacher! His teachings still guide me through my everyday life as a teacher and adult in society. I remember learning about the circle of fifths, chord progression, and true musicianship while being a member of the concert, jazz and marching band programs at Nansemond River High School. I remember him showing us videos of his college days playing the tuba, and that served as a motivating factor to get into college to join a college band. In addition, he worked hard to give us access to National Band Competitions and parades across the nation. We traveled to Georgia, North Carolina, Washington DC, and other states, which opened my eyes to the joys of traveling with music programs. My favorite band memory was when I marched in my high school band battle against I.C. Norcom High School. This was one of the best band battles that I participated in while in high school because we were able to showcase our strength as a band in the Hampton Roads area of Virginia. Prior to this battle, I.C. Norcom was the reigning champions of the National High Step Band Competition. I remember marching into the high school gym and hearing the fans cheer. We battled for 3 hours and at the end of the battle the fans were able to decide on the victor. This battle introduced me to the intensity of HBCU band battles, and really increased my interest in playing in a college band once I graduated. When applying to colleges as a senior at Nansemond River High School, I auditioned to play trumpet and french horn at North Carolina A&T University, Bethune-Cookman College, Norfolk State University, Hampton University, and Howard University. I was offered a music scholarship at every school that I auditioned; however, I chose to accept the Dozoretz National Institute for Mathematics and Applied Sciences scholarship at Norfolk State University. This scholarship was a rigorous 4-year academic program, so I was unable to march with the Spartan Legion. Although I did not pick up my trumpet in college, I did continue to record music and produce music in my spare time in the dorm. I am a teacher at Charlotte Learning Academy in Charlotte, NC. I am also a graduate student at The Johns Hopkins University School of Education where I am receiving my Masters of Science Degree in Education with a concentration in Secondary Studies. In addition, I serve a community leader in various community-based organizations that include O.N.E. Charlotte, Profound Gentlemen, and The Collective-Charlotte. In addition to teaching biology, earth science, and physical science, I teach a creative writing class at my high school where I am able to assist students with song structure and music production. We currently have 20 students enrolled in the class, and they find joy in creating science songs related to the content that I am teaching. Students are assigned roles that include an A&R, a publicist, and a marketing director. Each of these students plays a role in ensuring that our music is marketed to the proper market and that their music is creative enough to attract the attention of their peers. This course teaches students about the music business and the hard work that goes into creating a business on their own. As an adult, I have started a collection of vinyl record due to the pristine recording that occurred in the early 70s. I now use my spare time to create music with the use of my MPC- Renaissance, and ASR-10 sampling synthesizer. As a teacher and graduate student at Johns Hopkins University, I use music as a release from my long days. There is nothing more relaxing than coming home and listening to the melodic sounds of Ahmad Jamal, the groovy bass lines of Wes Montgomery, or the rich brass sounds of Lee Morgan. It's something about the equipment and techniques that were used between 1968-1973 that made their music sound organic and pure. I use sampling as a way to mesh those sounds of yesterday with the sounds of today's popular music. Keep striving for your goals. The arts and music are a lost passion in today's society due to the increased demand for science, engineering, and technology; however, music is an essential component to student growth and maturity. I think that it is important for striving musicians to know that they are fully capable of making a living from music if they are willing to work at their craft. Although I am not making a living as a musician, I would encourage those students to continue to work towards their goals and aspirations without letting anyone deter their vision. I currently teach high school science, and although I do not play my trumpet as often as I would like, I used music as a teaching device for my students to retain science content. I have attached the link to our SoundCloud page and my personal sound cloud page below. Today, we feature Robert L. Edwards. Robert is a Professor of Music and Director of Bands at Johnson C. Smith University and a business consultant. My grandfather was a musician, so I decided to follow in his footsteps. In elementary school, my cousins and I used to play a game called “parade” because we were fascinated with marching bands. We used trash can tops as cymbals and sticks for maces. Our imaginations were huge. In middle school, I joined the band because I wanted to be able to march in the marching band when I joined high school. My first instrument was the horn. I switched to trumpet the next year. By 9th grade, I was actually able to join the marching band. In high school, I played baritone. I made first chair district band that year and was able to audition for All State band. The next year, I played trumpet and made district band again. The following year, I made first chair district band and auditioned for All State on the trumpet. High school is also where I was first given the chance to arrange music for a band. Mr. Kenneth Woodley. He motivated me and helped me to be the person that I am. It's because of him that I understand music the way I do now. He helped me to apply to college, also influencing my choice of school. Because he was a father figure to me, he went the extra mile to go as far as to assist me with filling out the college application and, to this day, I think he is the one that paid my senior dues that year, too. I had saved up all of my change. Went to my guidance counselor to pay my dues and she told me they were taken care of. I know they both looked out for me. Everything. But, if I had to pick one, when I was in 11th grade one of the tuba players (our resident prankster) made a trombone player eat a chocolate covered cricket. She thought it was a regular piece of candy. When she found out that it was a cricket, she froze. Then she started rocking back and forth. After a few seconds of rocking, she got up, picked up a stand and hit him upside the head with it. I will never forget that. Yes, I played the trumpet at Norfolk State University. As I said earlier, my high school band director influenced my college choice. Professor of Music and Director of Bands at Johnson C. Smith University and business consultant. Music is my current occupation. It was in college that my band director, Dr. Sanford, told me that I was a jack of all trades and master of none. I was trying to do everything freshman year. I was a part of every organization on campus. His words helped me to focus myself. Because of my newfound focus on music, I was given the opportunity to arrange for the marching band. My arrangements caught the attention of other college band directors and I was able to obtain my first college job as Music Instructor and Assistant Director of Bands at Shaw University at the age of 25 because of it. I’ve had the chance to help others better themselves through music, whether it's in their current occupations or through the opportunity to go to college through scholarships. I also use music as a vehicle to guide students to develop their communication and soft skills that will assist them when they seek employment and other opportunities after graduation. If you want to go into music as a profession, you have to make sure you stay on your craft. Find a way to make yourself stand out from the other musicians. The only way to do that is to be yourself. Be humble. Study to perfect your practice so that you know what you are doing. Today, we feature Akeem Harris. Akeem is a Liability Determination Adjuster with Allstate. My parents introduced me into the world of music at a very young age, 5, with the violin and it just grew from there. During Elementary School, I was playing the violin and piano and taking lessons at Peabody Preparatory. Middle School was the same thing. In High School, I ended up picking up the oboe, playing in Woodlawn High School Jazz Band, Marching Band and Symphonic Band and also with the Greater Baltimore Youth Orchestra. I also had the opportunity to travel to the Ivory Coast in West Africa with the Woodlawn/Milford Mill Academy High School Jazz Bands. Ms. Stephanie K Sanders. She had awesome ways of motivating me and pushing me past my limits as a saxophone player. She cared about you as a person along with your musical abilities. My favorite memory from grade school was being able to get 5 notes out of my saxophone, lol. 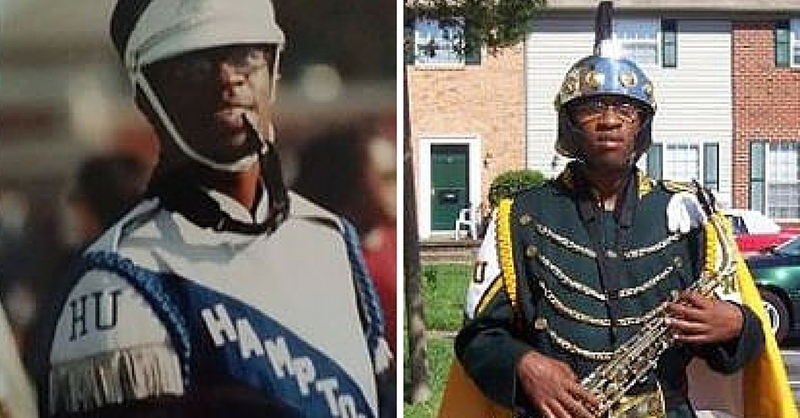 I played, Saxophone, Violin, and Oboe at Hampton and Norfolk State University. It impacted both schools I attended. The late, great Barney E. Smart gave me a scholarship for the oboe at Hampton and I had exposure to Norfolk's music program and I saw good things there as well. Liability Determination Adjuster with Allstate. It's a great conversation piece. In my adult life, it has been huge. It has allowed me to play with the UP Praise Team at Providence Baptist Church, various choirs at church, Baltimore's Marching Ravens, The Fort Washington Symphonic Winds, Hunt Valley Symphony Orchestra and other gigs. It keeps me grounded and focused and is a release from stress and tension. Don't let anyone destroy your dreams or put you in a musical box. I had teachers and others say, "You play too many instruments" or, "You can't be in all these different ensembles". As long as you have drive and dedication you can achieve it all. Phi Beta Sigma Fraternity INC (DZ) ( Nu Sigma Sigma).